"Kangaroo" is an elastic term that encompasses all 54 members of the family Macropodidae ("big foot"). These are the kangaroos, wallabies, wallaroos and pademelons of the Australian continent and nearby islands, pouched marsupials that occupy a variety of ecological niches, and it is occasionally surprising what they can, will and do eat. 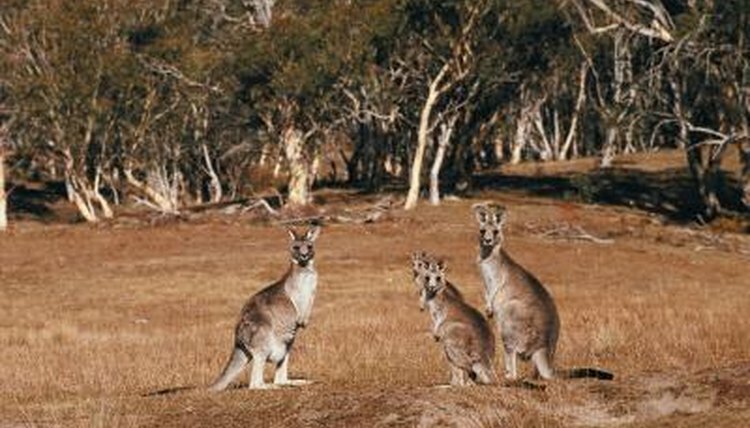 The big ground-living red and grey roos are grazing herbivores of the open plains, taking the place of the large grass-eaters on other continents, such as Africa's many antelope and North America's deer and bison. They also process their food in the same way, by cudding: swallowing the grass almost whole and then bringing it back up from one part of a chambered stomach to chew it thoroughly with large, flat teeth and then reswallow it to another part of the stomach for ultimate digestion. The smaller wallabies tend to spend more time in the bush and forest than on the plains, and consequently tend to browse on bushes and small trees more than they graze on grasses. Tree kangaroos spend most of their time up a tree, eating anything the tree provides, including leaves, bark, sap, fruit, seeds and flowers. They also eat things they find in and on the trees, from moss to bird eggs, baby birds and occasionally other small animals. This means they are not true herbivores, like their terrestrial relatives, but opportunistic omnivores, meaning they'll eat anything they find that can't get away. They even come down to terra firma occasionally and poach on the grass-eaters' patch. Roos can be a nuisance for Australian gardeners, because they love many of the same fruits and vegetables gardeners do and think of flowers -- especially roses -- as dessert. Also, what they don't eat, they trample with those big feet that give them their scientific name. They don't hesitate to help themselves to a garden if food and water get scarce in the wild when it doesn't rain, and when it does rain, the kangaroo population increases and gardens are still at risk. Defenses against a mob of invading roos feature fencing and landscaping with what hungry hoppers like least: aromatic plants such as eucalyptus, rosemary and lavender. Kangaroos in zoos get fed pellets formulated for grazers as a basic diet, but they also get alfalfa hay and a selection of the garden produce they love so much (carrots, apples, broccoli and bananas), plus extra greens, such as dandelion leaves and romaine. Tree kangaroos must also have leafy stuff to browse on, and their particular favorite munchies include willow and maple branches, as well as bamboo. Training treats, used to persuade them to do certain things their keepers need them to do -- like move from one enclosure to another -- include corn on the cob, sweet potato and raisins. MacroEvolution: What Do Kangaroos Eat?